Summary: Katsa has been able to kill a man with her bare hands since she was eight — she’s a Graceling, one of the rare people in her land born with an extreme, and in her case horrifying, skill. As niece of the king, she should be able to live a life of privilege, but Graced as she is with killing, she is forced to work as the king’s thug. When she first meets Prince Po, Graced with combat skills, Katsa has no hint of how her life is about to change. She never expects to become Po’s friend. She never expects to learn a new truth about her own Grace — or about a terrible secret that lies hidden far away… a secret that could destroy all seven kingdoms with words alone. Thoughts: Graceling reminded me of Poison Study – only with better writing. And considering how much I loved Snyder’s book, I’d say that’s a pretty big compliment. The novel was so well crafted and, honestly, I am astounded that it is Cashore’s first book. Katsa is a complicated character. She’s a rather tortured heroine – her killing Grace made her emotionally isolated, and was exploited by her none-to-kind uncle. On the other hand, her romantic lead Po, had his head screwed on the right way. Sure, he had some emotional baggage, but he was stable. Strong. Secure. And for some reason, I still found him swoon-worthy. That takes serious literary mojo. But let’s not forget: this is high fantasy. While the romance is important – the universe takes centre stage. As in all good fantasy novels, the world of Graceling is as familiar as it is magical. The kingdoms are corrupt, their leaders cruel, and the gracelings (those with magical powers) exploited. But, of course, there is good in every world. Despite my love of the novel, it did fall short in a few respects. I felt like the main villian wasn’t at all developed – we got a lot of answers to the “what?” but none to the “why?”. But besides that minor complaint, Graceling was perfect in every way. And by the way, Kristin Cashore? I have yet to forgive you for making me cry on the tube. Bottom line? Brilliant, beautiful book that you will fall right into. If you are a fan of Maria V. Snyder, this is a definite must – hell, it’s a must for any reader! I love that this review is very well-balanced. 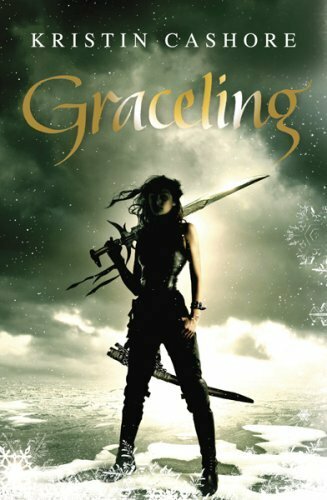 I have a copy of Graceling. I got it for Christmas. I still haven’t read hardly any of my Christmas books. Not good. But anyway, it sounds wonderful and I’m thinking I am going to enjoy it. I liked Maria Snyder’s Storm Glass but I haven’t started the Poison series yet. Nice call on the similarities to POISON STUDY. But with better writing. I agree. 🙂 Cashore’s writing is what absolutely kills me. I just fall into it and never want to leave. I feel the same way about FIRE. Hope you’re able to read that one soon because Oh. My. Word. Made of awesome. This looks like something I’d love to read. Very nice review!! Nice review Kay. I loved this one too, but have yet to read Fire. I haven’t read Poison Study, but it’s sat on my desk waiting. I’m really looking forward to it now! I read both Graceling and Fire. I was not sold on Katsa, felt she was unrelateable (to me anyway.) BUT I really LOVED Fire. That one almost made me cry. Great review – I need to get this book off my TBR list and on my read shelf! Great review! I felt the same way about the villain, but loved the overall Graceling world. @Angiegirl – I usually would have felt bad putting down Snyder’s writing, but after the epic fail that was Fire Study, I am ready to admit the truth! Also, I love that you felt the same way about Po – I was so confused when I actually… liked him! And thanks everybody, I am SERIOUSLY looking forward to Fire now!